Westgate Palace Resort in Orlando, Florida Near Disney - Bid Per 7 Night Stay in a 2 Bedroom Suite! 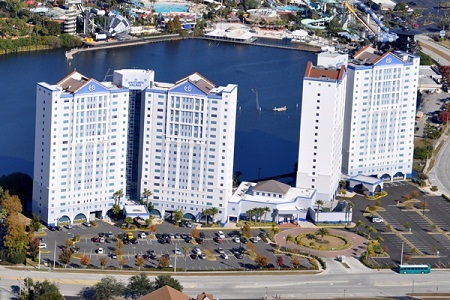 Enjoy 7 Nights in a 2 Bedroom Suite at Westgate Palace Resort in Orlando, Florida Near Disney! Sharing the lake with Wet 'n Wild water park, Westgate Palace is located in the heart of Orlando's International Drive area. Just a short walk from your well-equipped two-bedroom vacation suite, an exciting variety of dining, shopping, and entertainment awaits. At the resort, guests enjoy an outdoor swimming pool, tiki bar, game room, an array of activities including volleyball, basketball, table tennis, a fitness center, a playground, and spectacular views of the surrounding area. Universal Orlando, SeaWorld, and Walt Disney World are all just short drives away. The exquisitely decorated two-bedroom, two-bath villa creates the perfect backdrop for your Orlando vacation getaway. These villas feature a queen bed in the master bedroom, two twin beds in the second bedroom and a queen sleeper sofa in the living area, as well as a dining area, full bath with jetted tub and washer/dryer. Your 2 bedroom suite will sleep up to 6 people and comes with a full kitchen.